ROSEMONT, Ill., January 6, 2015 – Wizard World, Inc. (OTCBB: WIZD) continues its 2015 schedule with the inaugural Wizard World Presents Bruce Campbell's Horror Fest,March 6-8 at the Donald E. Stephens Convention Center. Held at the same venue as the famed Wizard World Chicago Comic Con, the Horror Fest will focus on all things horror, with appearances by noted celebrities from numerous genre films and television series. In addition to Campbell (The Evil Dead, Army of Darkness), fans can meet Tobin Bell (Sawfranchise), Tyler Labine and Alan Tudyk ofTucker & Dale vs. Evil, Dee Snider (“Twisted Sister”), Danny Hicks (Evil Dead II, Intruder), Michael Rooker (“The Walking Dead,” Guardians of the Galaxy), Kristy Swanson (Buffy The Vampire Slayer, 8 Heads in a Duffel Bag), Adrienne Barbeau (Creepshow, Escape from New York) and others. Bell will attend on Friday and Saturday; Snider and Tudyk will attend on Saturday and Sunday; the others are scheduled for all three days of the event. Other well-known Wizard World Presents Bruce Campbell's Horror Fest guests include Evil Dead stars Ted Raimi, Betsy Baker, Ellen Sandweiss and Theresa Tilly, Evil Dead II standouts Sarah Berry and Kassie DePaiva, and Cerina Vincent (Not Another Teen Movie). Wizard World is also the home of the most creative comics artists and writers on the planet. Artist Alley at Bruce Campbell's Horror Fest will feature Phil Ortiz (“The Simpsons,” “Muppet Babies”), Arthur Suydam (“Marvel Zombies,” “Army of Darkness”), Tyler Kirkham (“Action Comics,” “Superboy”),Mort Castle (“On Writing Horror,” “Shadow Show”) and many others. In addition, all full-price Bruce Campbell's Horror Fest attendees will receive a limited edition exclusive variant cover “The Walking Dead” comic, drawn by one of Wizard World's talented artist guests (to be announced shortly). Comics will be issued at registration while supplies last and VIP attendees will receive an additional black & white sketch version. Wizard World Comic Con events bring together thousands of fans of all ages to celebrate the best in pop-fi, pop culture, movies, graphic novels, cosplay, comics, television, sci-fi, toys, video gaming, gaming, original art, collectibles, contests and more. 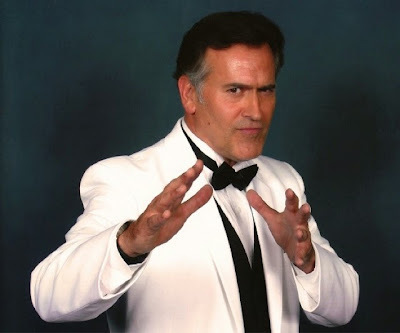 The sixth of 24 events currently scheduled on the 2015 Wizard World calendar, Bruce Campbell's Horror Fest show hours are Friday, March 6, 5-11 p.m.; Saturday, March 7, noon-8 p.m., Sunday, March 8, 11 a.m.-5 p.m.
Wizard World Presents Bruce Campbell's Horror Fest is also the place for cosplay, with fans young and old showing off their best costumes throughout the event. Fans dressed as every imaginable character – and some never before dreamed – will roam the convention floor and participate in the famed Wizard World Costume Contest on Saturday night. Wizard World (OTCBB: WIZD) produces Comic Cons and pop culture conventions across North America that celebrate the best in pop-fi, pop culture, movies, television, cosplay, comics, graphic novels, toys, video gaming, sci-fi, gaming, original art, collectibles, contests and more. A first-class lineup of topical programming takes place at each event, with celebrity Q&A's, the Wizard World Film Festival, comics-themed sessions, costume contests, movie screenings, evening parties and more. Wizard World also produces socialcon featuring social media stars and will be launching ConTV, a digital media channel in partnership with leading independent content distributor Cinedigm™ (NASDAQ: CIDM).